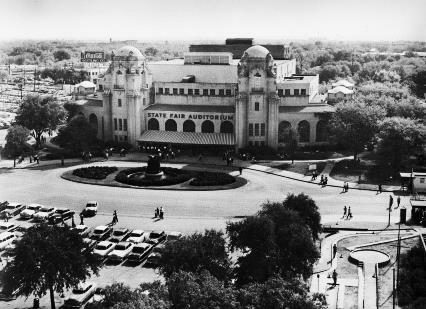 Dallas Summer Musicals (DSM) began in 1941 as Opera Under the Stars in the Band Shell at Fair Park. Without the benefit of air-con ditioning in the 40’s, performing outdoors was a better alternative than having to withstand the triple digit summer heat at an indoor facility in Dallas. The most important thing was for the audience to experience the magic of live theater. Opening night came on June 12, 1941, with a production of Sigmund Romberg’s Blossom Time, an operetta based on the life of Franz Schubert. The first season was co-produced by a group of local Dallas businessmen and The Schubert Organization in New York City, producers of touring theatrical productions. Ten shows, running a week each, were planned for the first season but the season was so successful that two additional shows were added. Ticket prices ranged from 30¢ to $1.10, and the season ended with a profit, despite the fact that a third of the performances were rained out. The onset of World War II prompted the cancellation of the season in 1942, but the summer theatre resumed operations in 1943 when a group of local businessmen established a non-profit organization to produce the season, under the name Starlight Operettas. A series of ten shows was presented that year, as well as in 1944. The State Fair Association decided the Starlight Operettas needed a full-time executive director. In 1944 it tapped legendary show business figure Charles R. Meeker to become the organization’s first Managing Director. After working with The Schubert Organization in 1941, Meeker providentially served as mentor to two young men – Tom Hughes and Michael Jenkins in the 1940’s and 1950’s who were to succeed him in later years continuing to bring quality entertainment to local audiences, decade after decade. 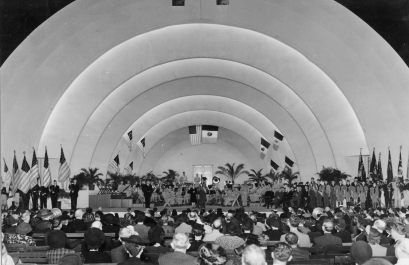 In the 40’s the Starlight Operettas started to book more contemporary Broadway musicals and made a number of physical changes to the Fair Park Band Shell, including a moving platform system that allowed rapid changes onstage. The organization introduced the star system at the theater in 1947 – during a time when Operettas continued to be the theater’s mainstay. For example the Starlight Operettas managed to persuade Mary Martin to open her national tour of Annie Get Your Gun in Dallas, which set box office records (105,000 people in two weeks). Two years later, the organization revived Rodgers and Hart’s Pal Joey, with its original Broadway star, Vivienne Segal. Almost written off at its debut in 1942, Pal Joey, thanks to Starlight’s production, returned to Broadway the next season and won critical reviews. This system continued to characterize the theater’s operation for decades, until audiences became more attracted to the title of the show than to the name of the people starring in the show. 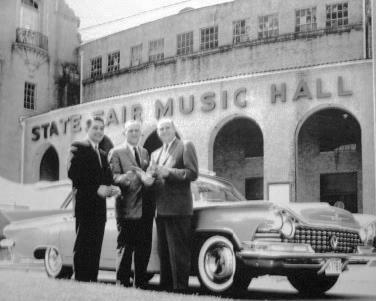 In 1951, after ten years in the Band Shell, the Starlight Operettas were able to move inside the Music Hall at Fair Park, thanks to the installation of air-conditioning. They also gained a new name as the State Fair Musicals during a move that not only boosted its audience comfort, but also allowed greater flexibility and creativity in the way shows were staged. The following year the State Fair Musicals previewed Porgy and Bess, with Leontyne Price and William Warfield. This innovative step paid off and the production was a sensation. After its premiere in Dallas, Gershwin’s opera went on to a worldwide tour. Throughout the 1950s, the State Fair Musicals kept the stars marching across the stage of the Music Hall – Debbie Reynolds, José Ferrer, Jack Benny, Gisele MacKenzie, Jeanette MacDonald, Judy Garland, and many, many more. 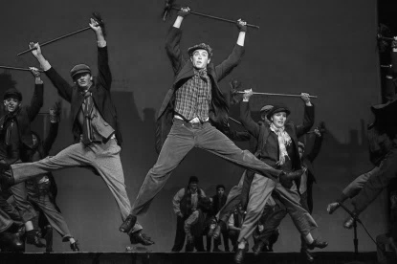 The organization also brought in major musical directors, such as Franz Allers, who went on to conduct My Fair Lady on Broadway, and a number of top choreographers. Operettas began to fade from the scene in the 1950s, a decade when touring shows and “personality” shows also became part of the pattern of a typical summer season. The Jack Benny Revue in 1954 was the first of a series of personality shows that included such glittering names as Carol Burnett, Mitzi Gaynor, Carol Channing and Jim Nabors, among others, over the years. In 1961 Charles Meeker resigned from the State Fair Musicals and went on to produce shows at the new Six Flags Over Texas. Tom Hughes, then the house manager at the Music Hall, took over management of the theater in 1961. Hughes left a distinct and enviable legacy behind. During his long tenure at the helm of the organization, he became nationally recognized as one of the most astute and successful producers of musical theatre in the country. In 1962, the State Fair Musicals separated from the State Fair of Texas and became an autonomous civic organization called Dallas Summer Musicals, Inc. (DSM). Carol Burnett made her first appearance that year, revitalizing a theatre that had begun having problems attracting large audiences. A second pause in the presentation of the musicals series came about over a long overdue renovation and remodeling of the Music Hall in 1972– a multi-million dollar investment that transformed the faded auditorium into one of the nation’s premier theater facilities. During the 1970s and 1980s several shows produced by DSM toured nationally. Such memorable productions included Peter Pan starring Sandy Duncan, and Hello Dolly! starring Carol Channing. In late 1994 following the death of Tom Hughes, Michael Jenkins answered a call to return to DSM and, in 1995, was named DSM’s President and Managing Director. That same year the organization began a transformation, instituting changes and putting a more contemporary spin on theater operations while maintaining an emphasis on traditional family entertainment. In 1999, DSM founded the DSM Academy of Performing Arts. 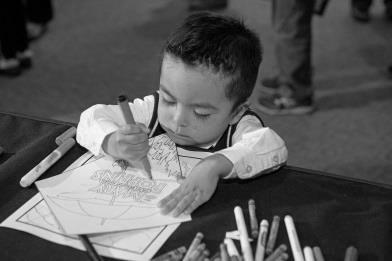 Since then, DSM has developed several outreach and educational initiatives that strive to impact the lives of children and families, and enrich the cultural landscape of the community. The turn of the twenty-first century brought the implementation of many great initiatives such as DSM Kids Club, a program geared towards fostering a love for the art form in tomorrow’s musical theatre audience. Through exciting activities, special events, backstage tours and informational exchanges, children gain an interest, hands-on knowledge and appreciation of the performing arts. DSM Seats for Kids was also developed to provide a meaningful theatre arts experience to low-income, at-risk and special needs children who otherwise could not afford to attend a live musical performance. Other great programs that were developed to enhance DSM’s mission include DSM Associate Producers, a group of young professionals who join together to support DSM, and the DSM Guild, the organization’s auxiliary group of volunteers, who host cast parties for each show, serve meals to the casts between matinees and evening performances and otherwise support DSM in more ways than we can count. Beginning in 2010, the experts at DSM made significant changes and upgrades to the Music Hall’s acoustical systems, improving the sound quality of the productions for all of its patrons, including the hearing impaired. This led to the development of DSM Hear Us Now!™; a device which utilizes five assistive listening technologies (T-coils, FM Classroom, Streamers, FM systems, and traditional headsets) to deliver a clear and direct audio signal. The system was so unique that a trademark has been allowed by the United States Patent and Trademark Office. scholarships and awards are presented to a number of outstanding and deserving participants during this evening where show business veterans and community celebrities come together to spotlight the achievements of high school students and their schools’ musical theatre programs. Winners of the Best Performance by an Actor and Actress receive an all-expense paid trip for five days to New York City to represent DSM and their high schools in the National High School Musical Theatre Awards (the Jimmy™ Awards) for the chance to win prizes and college scholarships. DSM has also had a long established tradition of providing discounted access to military veterans and their families. In 2015, Seats for Vets has been DSM’s newly developed initiative which serves war veterans and their families by providing them discounted access to a unique theatrical experience as a way of thanking them for their service. DSM’s Seats for Stars is a program that began its pilot stage in 2016 on the organization’s existing partnership with the Dallas Independent School District. The primary goal has been to recognize and celebrate the outstanding academic achievement of Dallas ISD. ponsors, the theatre opens its doors and offers complimentary seats to the community, filling the Music Hall’s 3,400 seats during one of DSM’s productions with individuals and groups from local schools, neighborhoods, and other nonprofits who serve the community. 2016 brought about the brink of a revolutionary transformation in Dallas, especially within the arts community. Acknowledging the vitality and diversity on Broadway, DSM announced a partnership with Broadway Across America to ensure that DSM will remain relevant and continue to bring the absolute best Broadway shows to DSM’s patrons and to the Dallas area. DSM has been a staple of the arts community in Dallas since the 1940s. DSM is a nonprofit organization which presents and promotes excellence in live musical theatre, and strives to invest in the community as it continues to enrich the cultural landscape of North Texas and the Southwest Region.